Check Out the New Archive! In case you haven’t noticed, there is a new tab featured at the top. 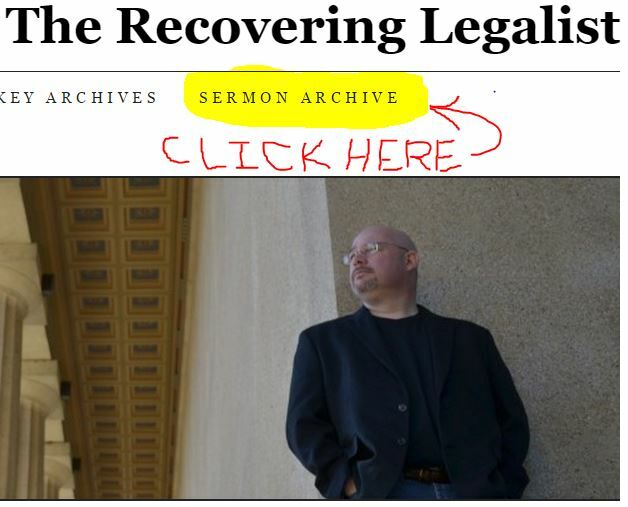 It is an archive of sermons that I have preached both at church and on the radio. They will start with the most recent and work back – at least to when I started recording (and I might leave a out a few). I will keep adding older ones as I have the time to upload and link them. It’s not easy writing with a mouse. Click on the real tab at the top of the home page, not the highlighted part in the picture (in case you were confused). If any of these sermons are a blessing to you, feel free to share them as you like. Of course, I always welcome feedback of all kinds (as long as it’s not hateful), including questions, comments on delivery, etc. Why am I doing this? Well, it’s hard to ignore the obvious opportunity of getting the preached Word of God out into the world. For crying out loud, when might I ever get to physically expound the Bible in most of the places from which I have readers? This way what I preach from the pulpit in Chattanooga can be heard in nearly 130 countries!! I am not the greatest preacher, nor will I ever pretend to be. Quite frankly, it could be argued that my writing is better than my speaking (at least I think so). However, some people respond differently to different styles of delivery and personality. Maybe at least this way someone will hear the Truth of the Gospel in such a way that it might stick when it only bounced off before. Most of the recordings you listen to were simply recorded on my iPhone placed on the pulpit. One day I would love our little church to have some more high-tech recording capability, even video, but it is what it is.